The end of the housing boom in 2006 set in motion a vicious circle that led to disaster for millions of homeowners whose property has been seized or threatened, and for the lenders themselves, who have had to write off tens of billions in losses. Foreclosures helped accelerate the fall of property values, helping to spur more foreclosures. The losses they created brought the financial system to the brink of collapse in the fall of 2008. The steep recession that followed led to even greater homeowner delinquencies, as homeowners who lost their jobs often lost their homes. Tens of millions of others found themselves in homes worth less than their mortgages, unable to sell or refinance. 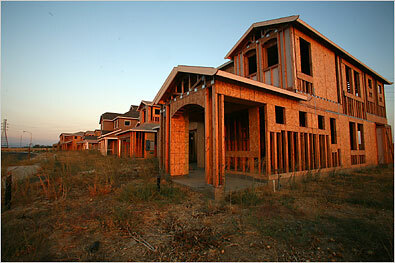 All told, roughly four million families lost their homes to foreclosure between the beginning of 2007 and early 2012. In late 2010, evidenced emerged that the foreclosure process may have been deeply tainted by sloppy recordkeeping, cut corners and possible fraud, epitomized by high-profile cases of “robo-signing’’ — cases in which foreclosures took place based on forged or unreviewed documents. More than 40 states attorneys general began investigations into foreclosure abuse, and worries about the legal fallout from the scandal led to a sharp slowdown in the rate of foreclosure filings and of repossessions in 2011. In February 2012, government authorities and five of the nation’s biggest banks — Bank of America, JPMorgan Chase, Wells Fargo, Citigroup and Ally Financial — agreed to a $26 billion settlementthat could provide relief to nearly two million current and former American homeowners. Despite the billions earmarked in the accord, the aid will help a relatively small portion of the millions of borrowers who are delinquent and facing foreclosure. The success could depend in part on how effectively the program is carried out; earlier efforts by Washington aimed at troubled borrowers helped far fewer than had been expected. Still, the agreement is the broadest effort yet to help borrowers owing more than their houses are worth, with roughly one million expected to have their mortgage debt reduced by lenders or able to refinance their homes at lower rates. Another 750,000 people who lost their homes to foreclosure from September 2008 to the end of 2011 will receive checks for about $2,000. And because of a complicated formula being used to distribute the money, federal officials say the ultimate benefits provided to homeowners could equal a larger sum — $45 billion in the event all 14 major servicers participate. The aid is to be distributed over three years, but there are incentives for banks to provide the money in the next 12 months. In addition to disagreements over the total amount, negotiations had been held up over the question of how much latitude authorities would have in pursuing investigations into mortgage abuses. In the agreement’s expected final form, the releases are mostly limited to the foreclosure process, like the eviction of homeowners after only a cursory examination of documents. The prosecutors and regulators still have the right to investigate other elements that contributed to the housing bubble, like the assembly of risky mortgages into securities that were sold to investors and later soured, as well as insurance and tax fraud. Officials will also be able to pursue any allegations of criminal wrongdoing. In March, documents filed in federal court spelled out how bankswill face stiff penalties and intense public scrutiny if they fail to live up to the deal’s standards. In some cases, servicers would face civil penalties of up to $1 million for each violation of federal banking law. An independent monitoring and enforcement office is being set up under the agreement, to be paid for by the banks. Two studies released around the time of the settlement underscored the pervasiveness of the practice. An audit by San Francisco county officials of about 400 foreclosures there determined that almost all involved either legal violations or suspicious documentation. And a wide-ranging review by federal investigators found thatmanagers at major banks ignored widespread errors in the foreclosure process, in some cases instructing employees to adopt make-believe titles and speed documents through the system despite internal objections. Also in March, a senior Federal Reserve official recommended fines for eight additional financial firms, raising questions about how deep foreclosure problems run through the banking industry. The eight firms cited by the Federal Reserve — HSBC’s United States bank division, SunTrust Bank, MetLife, U.S. Bancorp, PNC Financial Services, EverBank, OneWest and Goldman Sachs — should be fined for “unsafe and unsound practices in their loan servicing and foreclosure processing,” Suzanne G. Killian, a senior associate director of the Federal Reserve’s Division of Consumer and Community Affairs, told lawmakers in a House Oversight Committee hearing in Brooklyn. The recommendation is the culmination of an investigation begun nearly two years previously over accusations that bank representatives had been churning through hundreds of documents a day in foreclosure proceedings without reviewing them for accuracy, a practice known as robo-signing. Some see the Fed’s recommendation as an attempt to push these firms to agree to the terms of the broader mortgage settlement involving the state attorneys general and federal officials. During those settlement talks, federal regulators contacted other institutions in hopes that they would also agree to the terms, according to people briefed on the negotiations. Weeks after the foreclosure settlement was reached, debate continued over how much it would do to help homeowners. Critics pointed out that more than half of the $17 billion earmarked to help borrowers to stay in their homes could be used in ways that will not stop foreclosures, including some activities that are already standard bank practices. For example, the banks can wipe out more than $2 billion of their obligation by donating or demolishing abandoned houses. Almost $1 billion can be used to help families that have already defaulted move out. Outside of the settlement, some state courts have also become more aggressive about challenging foreclosures. In January 2011, Massachusetts’s top court voided the seizure of two homes by Wells Fargo & Company and US Bancorp after the banks failed to show that they held the mortgages at the time of the foreclosures, and courts in several states are considering similar cases. The root of today’s problems goes back to the boom years, when home prices were soaring and banks pursued profit while paying less attention to the business of mortgage servicing, or collecting and processing monthly payments from homeowners. Banks spent billions of dollars in the good times to build vast mortgage machines that made new loans, bundled them into securities and sold those investments worldwide. Lowly servicing became an afterthought. When borrowers began to default in droves, banks found themselves in a never-ending game of catch-up, unable to devote enough manpower to modify, or ease the terms of, loans to millions of customers on the verge of losing their homes. Now banks are ill-equipped to dealwith the foreclosure process. The revelations about the sloppy paperwork emboldened homeowners and law enforcement officials in many states to challenge notarizations — including those by so-called robo-signers,’ employees who approved hundreds of documents in a day — and to question whether lenders rightfully hold the notes underlying foreclosed properties. Evictions were expected to slow sharply — good news for many homeowners. But at the same time, the freezes further disrupted an already shaky housing market. As banks’ foreclosure practices have come under the microscope, problems with notarizations on mortgage assignments have emerged. These documents transfer the ownership of the underlying note from one institution to another and are required for foreclosures to proceed. In some cases, the notarizations predated the preparation of the legal documents, suggesting that signatures were not reviewed by a notary. Other notarizations took place in offices far away from where the documents were signed, indicating that the notaries might not have witnessed the signings as the law required. The swelling outcry over fast-and-loose foreclosures thrust the Obama administration back into the uncomfortable position of sheltering the banking industry from the demands of an angry public. While Mr. Obama did block a law passed by Congress that was seen as unintentionally making it easier to speed up foreclosures, his aides spoke out against calls from many Democrats for a national freeze on evictions, fearing that a moratorium could hurt still-shaky banks. Overall, there have been three distinct waves in foreclosures. The initial spike involved speculators who gave up property because of plunging real estate prices, and the secondary shock centered on borrowers whose introductory interest rates expired and were reset higher. The third wave represents standard mortgages, known as prime, written to people who had decent credit ratings, but who have lost their jobs in the economic downturn and are facing the loss of homes they had considered safe. Those sliding into foreclosure today are more likely to be modest borrowers whose loans fit their income than the consumers of exotically lenient mortgages that formerly typified the crisis.Economy.com said in 2009 that it expected that 60 percent of the mortgage defaults that year would be set off primarily by unemployment, up from 29 percent in 2008. The slowdown in evictions may give such borrowers time to accumulate some capital or more leverage in settlement talks with their lender. Some analysts said that could conceivably help the housing market get back on its feet, by ending the undermining effect of a steady stream of foreclose houses going up for sale. Others, however, worried that blocking sales in an already weak market would drive prices down even further, continuing a spiral that has been deeply destructive to banks and communities. Interviews with bank employees, executives and federal regulators suggest that this mess was years in the making and came as little surprise to industry insiders and government officials. Almost overnight, what had been a factorylike business that relied on workers with high school educations to process monthly payments needed to come up with a custom-made operation that could solve the problems of individual homeowners. To make matters worse, the banks had few financial incentives to invest in their servicing operations, several former executives said. A mortgage generates an annual fee equal to only about 0.25 percent of the loan’s total value, or about $500 a year on a typical $200,000 mortgage. That revenue evaporates once a loan becomes delinquent, while the cost of a foreclosure can easily reach $2,500 and devour the meager profits generated from handling healthy loans. And even when banks did begin hiring to deal with the avalanche of defaults, they often turned to workers with minimal qualifications or work experience, employees a former JPMorgan executive characterized as the “Burger King kids,” walk-in hires who often barely knew what a mortgage was. At Citigroup and GMAC, dotting the i’s and crossing the t’s on home foreclosures was outsourced to frazzled workers who sometimes tossed the paperwork into the garbage. And at Litton Loan Servicing, an arm of Goldman Sachs, employees processed foreclosure documents so quickly that they barely had time to see what they were signing. Anecdotal evidence indicating foreclosure abuse has been plentiful since the mortgage boom turned to bust in 2008. But the detailed and comprehensive nature of the San Francisco findings released in February 2012 suggest how pervasive foreclosure irregularities may be across the nation. The improprieties range from the basic — a failure to warn borrowers that they were in default on their loans as required by law — to the arcane. For example, transfers of many loans in the foreclosure files were made by entities that had no right to assign them and institutions took back properties in auctions even though they had not proved ownership. In a significant number of cases — 85 percent — documents recording the transfer of a defaulted property to a new trustee were not filed properly or on time, the report found. And in 45 percent of the foreclosures, properties were sold at auction to entities improperly claiming to be the beneficiary of the deeds of trust. In other words, the report said, “a ‘stranger’ to the deed of trust,” gained ownership of the property; as a result, the sale may be invalid, it said. In 6 percent of cases, the same deed of trust to a property was assigned to two or more different entities, raising questions about which of them actually had the right to foreclose. Many of the foreclosures that were scrutinized showed gaps in the chain of title, the report said, indicating that written transfers from the original owner to the entity currently claiming to own the deed of trust have disappeared. The audit also raises serious questions about the accuracy of information recorded in the Mortgage Electronic Registry System, or MERS, which was set up in 1995 by Fannie Mae and Freddie Mac and major lenders. The report found that 58 percent of loans listed in the MERS database showed different owners than were reflected in other public documents like those filed with the county recorder’s office. The banks have argued that despite document errors, foreclosures were justified because borrowers had fallen behind on their payments. But the federal report issued in March 2012, which focused on foreclosures from 2008 to 2010 of federally backed loans serviced by five major banks, suggests that the banks violated state laws governing the foreclosure process. At Bank of America, which until late last year was the nation’s largest mortgage servicer, two employees testified that they had raised concerns about whether documents were being properly notarized, but managers told them to proceed. One vice president said documents in her department were checked only for “formatting and spelling errors,” not the underlying figures or facts in the case. At Wells Fargo, now the nation’s largest mortgage servicer and originator, employees told the inspector general’s office that the company’s management had assigned them bogus titles, including “vice president of loan documentation,” even though they had no training in document review. Before becoming vice president, one employee worked at a pizza restaurant. Wells Fargo’s management quashed an independent study by a manager responsible for overseeing the affidavit process. The study had started to show that the document department was critically understaffed. “The midlevel manager was directed to stop the study and return to the practice of signing affidavits without reading or verifying data,” the report said. And instead of remedying the problems, Wells Fargo’s management shortened the review period to less than 48 hours instead of five to seven days, the employees said.